Five strategies to cut your travel food bill. 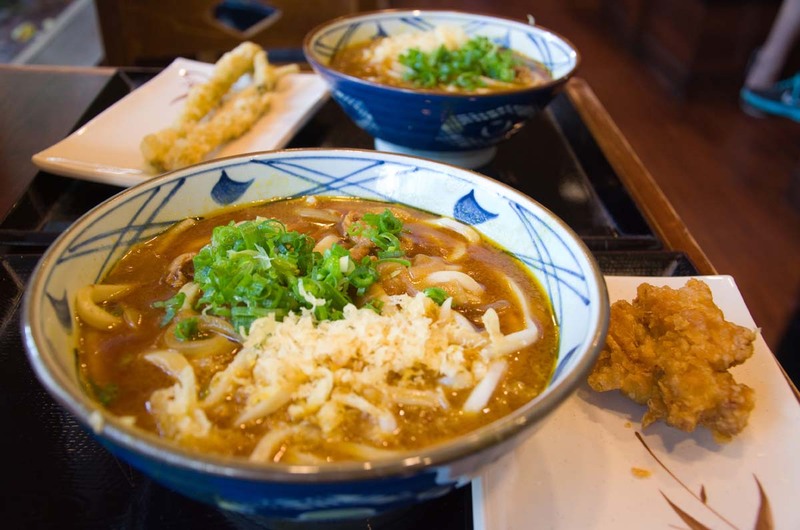 Delicious handmade Japanese noodles from Marukame Udon in Waikiki for as little as $3.75 per bowl. Hawaii is an expensive travel destination, or so we’ve been told. And before arriving we fully expected to shell out a ton of cash on food. Needing to buy three meals per day, every day, at high-priced restaurants and cafes in this island paradise can really dent your wallet. But it doesn’t have to. Here are the strategies we used to survive three weeks on the island and a lifetime on the road while still eating well and saving a fortune. Get in my belly! 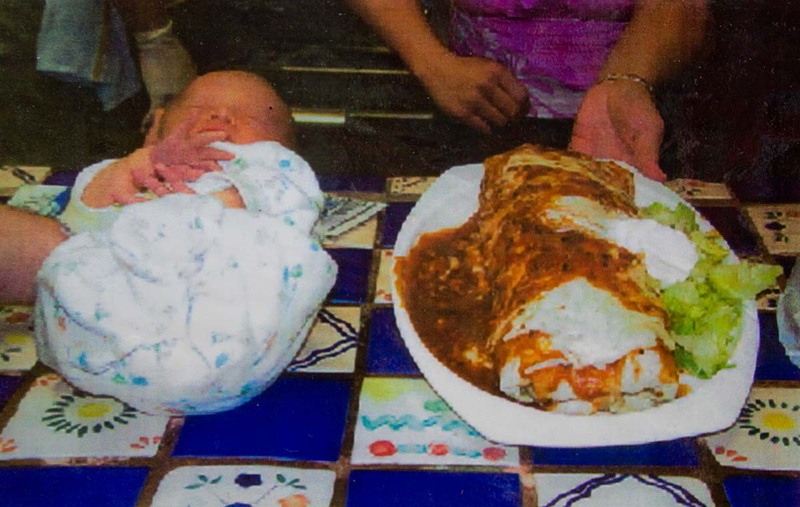 This baby sized “Burrito Grande” at Lucy’s Taqueria in Hilo, HI is all yours for $10.95. Portion sizes in the U.S. are monstrous. But unless you’re Adam Richman of Man v. Food you don’t actually need to stuff yourself to the point of busting with everything that’s put in front of you. In most places Shannon and I can easily share a standard sized dinner portion and still leave with full bellies, not to mention full wallets. For those traveling alone, leftovers are not only your friend; they’re a friend who picks up half your dinner tab. We generally prefer to eat street food whenever we can find it. It’s not only cheaper than restaurant fare it’s often tastier and always speedier. The beauty of food trucks and stalls is that they can only do one thing to win repeat business: make great food. They can’t draw people in with hip décor, swank service or sometimes even a table, so their full attention goes into the meals they serve. As a bonus, there is no waiter to tip. 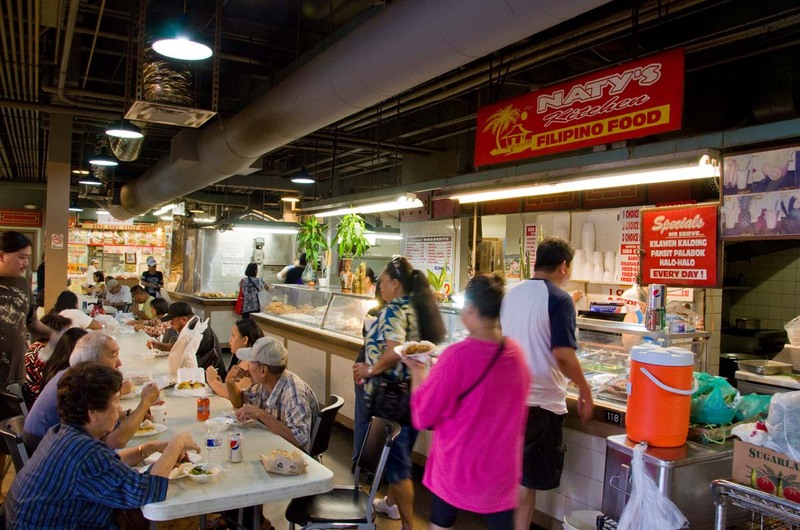 Chinatown’s central marketplace is light on ambiance but heavy on value. You’ll find a wide variety of vegetable and meat dishes here starting around $4.00. 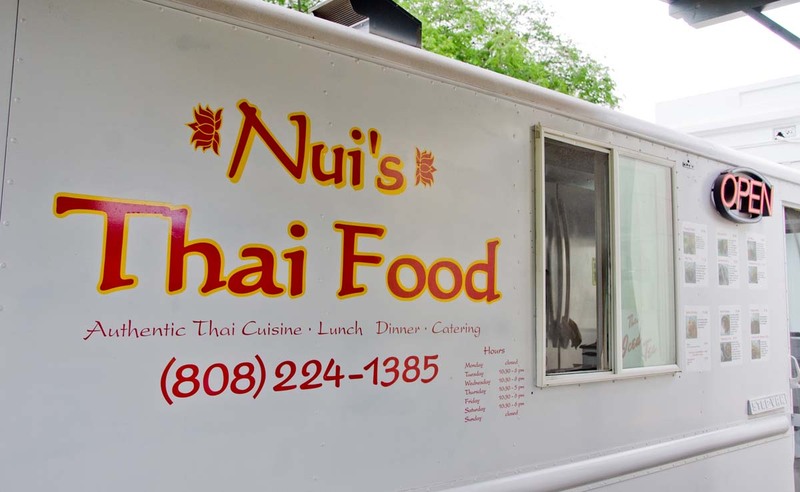 All the reasons we love food trucks apply in reverse to restaurants on main tourist thoroughfares. They jack up prices and plate mediocre food knowing their vacationing patrons will never return. Meanwhile, a few blocks away a family owned restaurant is struggling mightily to earn the loyalty of local customers. It really is worth the extra effort in seeking them out. How much can you save? Tons. In San Pedro, Belize, the beachfront resorts were charging $30 for plates of terrible barbeque and marinara pasta. 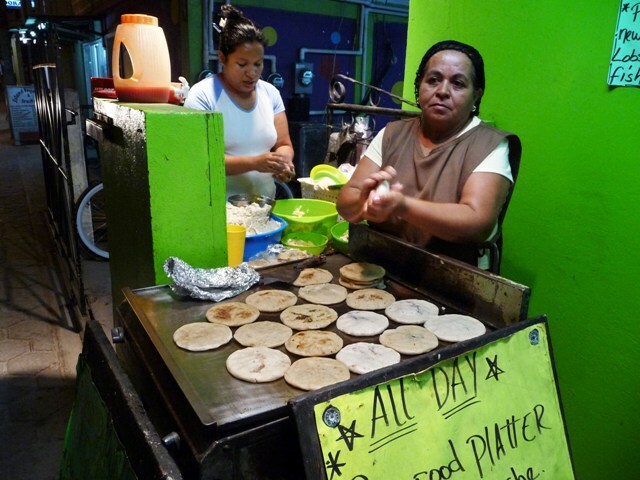 A mere two streets away we found a local woman hand making papusas for $1.25 each. Bonus Waikiki recommendation: Pearl’s Korean Barbeque serves up a massive plate of rice and four vegetable side dishes. There’s more than enough to share for $8.49 but you’ll have to venture into the basement of a shopping mall to find it. The best way to save a buck on dining out is to dine in. 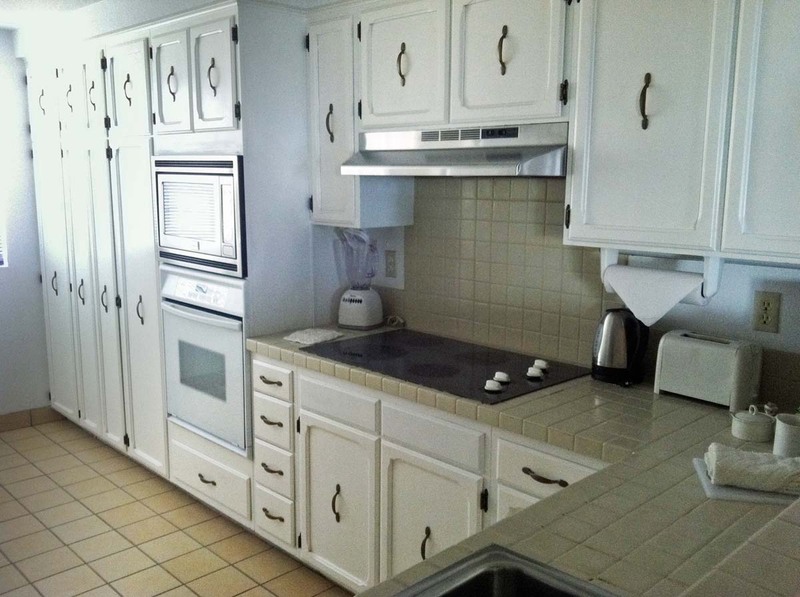 Wherever we travel we always try hard to find lodging that comes with full kitchens. Sometimes that means staying in hostels. Other times it means scooping up a bargain timeshare like the gigantic one-bedroom condo we scored in Kona, HI. Loaded up with groceries we enjoyed bacon and egg breakfasts and roast chicken dinners that cost us just a couple of bucks per meal. When we can’t have a full kitchen we at least try to find a room with a refrigerator. That enables us to store leftovers, have milk for cereal, and chill a six pack so we can skip the next tip altogether. This is something that works great in theory, although we’ve never actually tried it. The largest portion of most restaurant tabs is the bar bill. You can easily cut your dinner expense in half by simply drinking water. 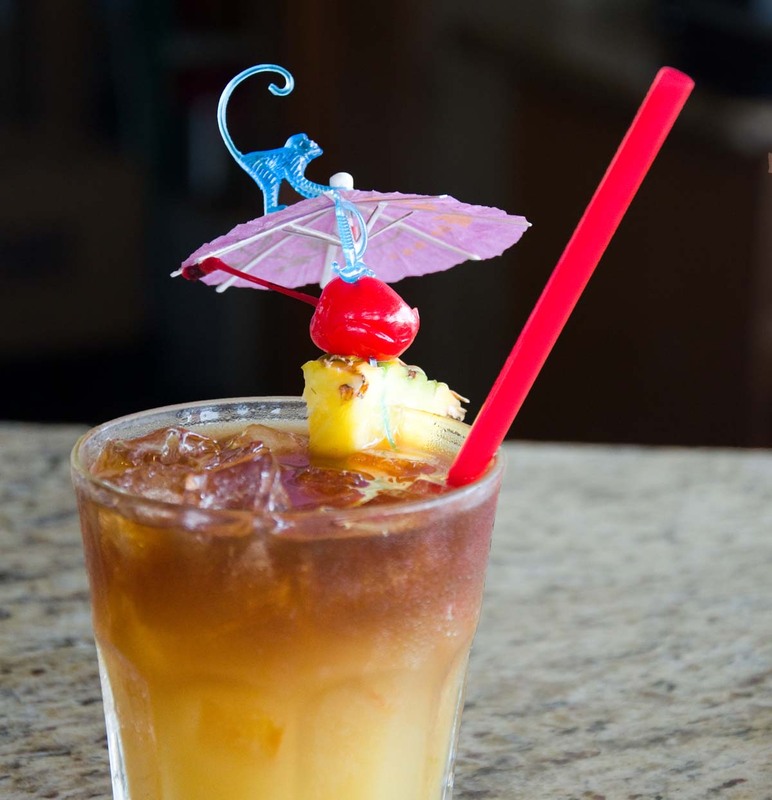 Or, you can do what we did and head over to happy hour at the Shorebird in Waikiki for their $3.50 Mai Tais. Excellent advice, Brian. Eating out when traveling is so seductive (new food to try!) but expensive. Like you, we usually follow for of you give points whenever we can. The funny thing, though, is that in many places the local cuisine is pretty inexpensive. That’s obviously not true in places like Paris. But in many parts of the world you really can gorge on local food for pennies. It’s often when you try maintain your hometown diet abroad that you really run up the food bill. Fairly common sense suggestions, which any experienced traveller will know. However, less experienced travellers are advised to take notes. Chinatown and virtually any ethnic enclave in any good sized city typically yields similar results. Great advice, and don’t forget all the farmer’s markets (if you have any sort of kitchen where you’re staying). There are a ton of them all over Hawaii. Too bad you missed Eat the Street” in which dozens of food trucks come together to provide a feast like you can’t believe. Gourmet food at budget prices. Good tip on the farmers market. And yeah, we love those food truck events. That way we don’t have to hunt them down individually, which can be a bit of a pain. Great tips, I am looking to travel to Hawaii soon and have bookmarked this! Yeah, the no alcohol thing is an austerity too far for us as well. Great tips! Hawaii is on my bucket list so I will definitely be keeping this gem of advice on hand! Thanks. Definitely keep Hawaii on the list. It’s well worth the effort and the expense.